The Legislature approved sweeping changes to Utah’s elections and voter registration laws that supporters say will ensure that people like Gerardo Navarro’s vote counts in November. Navarro was at state offices in Draper recently, renewing his driver license, but didn’t notice a box that asked him if he’d like to update his voter registration. Navarro’s not alone. One in three eligible voters didn’t check the box to update his or her registration in 2016, according to county clerks who spoke in favor of registering voters automatically when they interact with the Driver License Division. “A lot of people think that because they got their driver license they were registered,” said Weber County Clerk Auditor Ricky Hatch. “A lot of voters would come in, like in 2016, and say I’m registered,” try to vote, and find out they weren’t. Not only will they be more likely to be registered under HB218, which passed on Wednesday, those who were eligible and tried to vote on Election Day but weren’t registered will be able to do so in the next election. If Gov. Gary Herbert signs the bill, eligible voters will no longer be able to finish their driver license transaction at the DLD without telling the state whether they’d like to vote. They would still have to opt in to register to vote. The change could have an outsize impact on the number of people on Utah’s voter rolls, supporters said, by implementing Utah’s version of automatic voter registration laws that are being passed across the country in recent years. Under automatic registration, people who are eligible to vote are registered or have their information updated on voter rolls without having to check any boxes. They’re given the option to unregister when their county clerks contact them shortly after being registered. Oregon has seen its number of registered voters skyrocket as a result of its law. 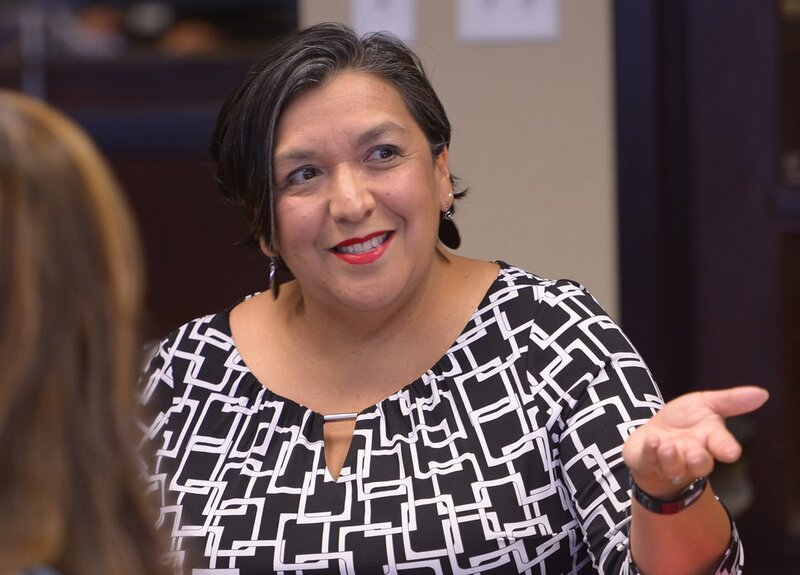 Two other bills this session would have enacted automatic voter registration, but the idea was amended and folded into Rep. Rebecca Chavez-Houck’s bill early in the session over concerns by some Republicans who wanted voters to take action to register to vote. “There’s a certain ideological perspective more present in the House than Senate that voting is a privilege, not a right,” said Chavez-Houck, the retiring Salt Lake City Democrat who has spent years pitching voter changes in Utah and sponsored the bill that also included other election-law changes. Keeping the “opt-in” registration process in place was important for some Republicans who eventually supported HB218. “We see a lot of apathy out there,” said Rep. Jeremy Peterson, R-Ogden. “In a participating democracy … it shouldn’t be a casual thing” to register to vote. Leah Hogsten | The Salt Lake Tribune l-r District 24 House Rep. Rebecca Chavez-Houck discusses immigration and its effects on Utah businesses. A coalition of Utah business leaders and the Salt Lake Chamber of Commerce joined Wednesday, July 9, 2014 on the National Day of Action for Immigration Reform to call for immediate changes to immigration laws to drive job creation and growth for Utah and our nation. Chavez-Houck’s bill was used as a vessel for several significant election policy changes that ended up in HB218. Legislators decided to take Chavez-Houck’s original proposal, which would allow eligible voters to register on Election Day, an effort she’s been working on since 2010, and add provisions that were negotiated over several weeks of the session. Another provision added to the bill would remove voters from the list of vote-by-mail voters if they don’t participate in two straight general elections, which Peterson said may lead to a “significant” drop in people signed up for provisional ballots within four years of the bill taking effect. Counties – nearly all of which moved to conduct their elections exclusively by mail – will also be required to give voters an opportunity to cast ballots in person before the election deadline. Counties would be required to open at least one voting center and keep it open for at least four days before an election (and up to 14 days). Chavez-Houck said that portion of the bill will help particularly in rural areas of Utah and in San Juan County, which is home to a large portion of Navajo tribal members in the state. She said the bill will make it easier for voters to cast ballots. — Reporter Eric Baker contributed reporting.